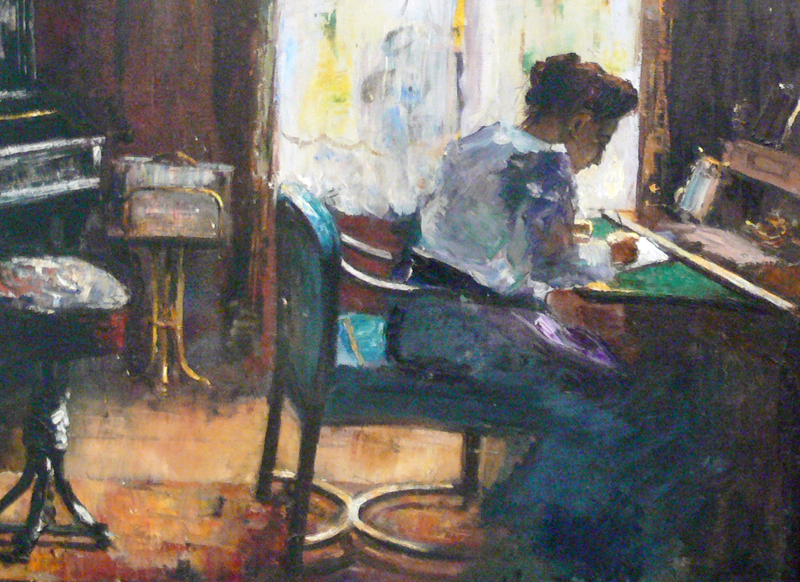 Detail from Frau am Schreibtisch (Woman at Writing Desk), 1898, oil on canvas by German artist Lesser Ury (1861–1931). See the entire painting at Wikimedia Commons. I heard some time ago, that Anthony Trollope had a theory that a boy might be brought up to be a novelist as to any other trade. He brought up—or attempted to bring up—his own son on this principle, and the young man became a sheep-farmer, in Australia. The other day Miss Thackeray [Anne Ritchie, the daughter of William Makepeace Thackeray] said to me that she and her husband meant to bring up their little daughter in that way. It hereupon occurred to me (as it has occurred before) that one might make a little story upon this. A literary lady (a poor novelist)—or a poor literary man either—(this to be determined)—gives out to the narrator that this is their intention with regard to their little son or daughter. The idea remained dormant for ten years, but in February 1889 James revisited the entry and added a few details to the tale, in which “the mother (this especially if it be a ‘lady-novelist’) tries to enable the son to go out in the world for her own purposes.” Three years later the result, “Greville Fane,” was published in two installments in the weekly Illustrated London Tales. James’s satire is hardly limited to mockery of parents who develop a regimen to raise a fiction writer. He reserves his most caustic remarks for commercially successful authors who crank out book after book without regard to artistic merit or innovation. Most of the story’s ridicule is at the expense of the protagonist, a woman who writes under the pseudonym Greville Fane. As the tale unfolds, however, James goes beyond the basic idea outlined in his journal, and the result is a more sympathetic portrait of “Greville Fane” than one might expect. A question pondered by many readers and scholars is whether James modeled his lead character on one of his contemporaries. During the last century a number of authors have been proposed as inspirations, and James knew, read, and reviewed many of them. 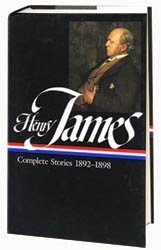 Among the more obvious candidates are Mary Elizabeth Braddon, whose 80 novels include the 1862 blockbuster Lady Audley's Secret; Mrs. Oliphant (Margaret Wilson Oliphant), the immensely popular author of more than 120 books; and James Payn, a friend of James’s whose oeuvre includes 46 novels and countless stories, many of them best sellers. More recently, literary scholar John Carlos Rowe has brought the story of James’s story full circle with the intriguing suggestion that the real target of the story was the Trollope family, particularly Anthony himself. In the character of Greville Fane, Rowe claims, readers “ought to recognize the caricature of Trollope’s mother, Frances,” whose more than forty books included the extraordinarily influential Domestic Manners of the Americans. Theirs was a family of prolific and popular writers: Anthony’s brother Thomas published sixty books and Anthony himself is, of course, still remembered for his fifty-plus novels and story collections. Like Greville Fane, Anthony Trollope suffered from a decline in reputation late in his career, as literary tastes changed and his novels began to seem too formulaic to readers. And like Greville Fane, he had tried and failed to mold his son into a novelist. Among the French expressions used by James are gagne-pain (livelihood, means of subsistence), premier frais, (initial outlay), vieux jeu (old hat, old-fashioned), embonpoint (girth; fleshiness), and trouvailles (finds, discoveries). Coming in to dress for dinner, I found a telegram: “Mrs. Stormer dying; can you give us half a column for tomorrow evening? Let her off easy, but not too easy.” . . . If you don't see the full selection below, click here (PDF) or click here (Google Docs) to read it—free!